Recently I wrote about the abundance of solar energy available to us, and the small fraction of it we would need to capture to meet all of our energy needs. I received a comment questioning the value of renewable energy and disagreeing with the statement that renewable power had no impact on the environment. However, I didnâ€™t say it had no impact, because everything we do has some impact on the environment. What I did say was that the environmental impact of renewable energy is far more benign than that of coal or nuclear energy. Iâ€™ll start out by addressing solar energy, since that was the topic that sparked this question. Any global temperature effects caused by solar power would be absolutely insignificant compared to global warming influenced by burning fossil fuels. By capturing the heat with a CSP facility, it is being diverted from soaking into the ground, this is true. If you cover a large enough area with this type of energy facility, it will have a measurable effect on both ground temperature and local air temperatures as the energy is no longer warming the ground and therefore the air above it. This may affect the weather in some small degree, but for this to happen the facility would have to be far larger than Iâ€™m advocating for. The best solution for this is to have a distributed network of generating facilities, each small enough to create only a minimal environmental impact. 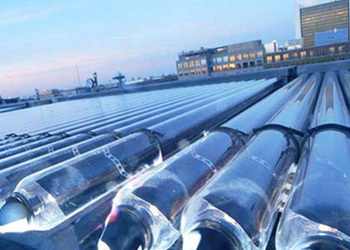 The photo at the top of this page is of a solar heating system mounted on the roof of a commercial building; it achieves the same basic effect as the CSP equipment, but lacks the focusing mirrors and doesnâ€™t produce steam. 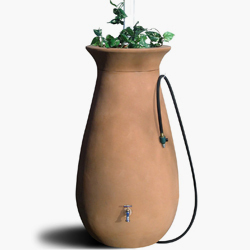 In this case, solar energy that would have previously been absorbed by the roof is instead used to produce hot water. Before this system was put in place, the solar energy would have heated up the building; requiring increased air conditioning to bring it back down to desirable levels. By capturing this energy, a twofold purpose is achieved. A centralized solar power plant would be useful as a short to medium term solution, as it would be easy to construct, inexpensive compared to a nuclear facility, much cleaner than the cleanest of the coal plants, and would make use of readily available technology and the existing infrastructure. In the future, however, the ideal solar solution is to have solar cells integrated into building roofs, to let buildings supply much of their own electrical power. As technology progresses, residential solar cells will look like normal shingles or tiles, and less like something youâ€™d expect to find on a moon base. Wind energy is another issue, itâ€™s a little harder to realistically advocate wind turbines on residential houses. Even land-based windfarms have their share of problems, such as blocking scenic views from some peopleâ€™s houses, the possibility of interfering with bird migration paths, low-frequency sound waves from older turbines causing problems, and limitations of land use. For this reason, I believe that offshore wind is the best solution as it can address all of the issues listed above. Again with the wind power, distributed is best. Rather than having a massive wind farm in one location, a series of smaller locations would result in a reduced environmental and visual impact. I personally think a whole line of wind turbines is an attractive scene, but I can appreciate that others do not agree with that. Therefore the best solution is to put the turbines out in the water where theyâ€™re out of sight, but also are the most efficient; a win-win situation. Despite all of the concerns about the impacts of renewable energy, they are insignificant towards the impact created by coal power and nuclear power stations. Critics often comment that birds are killed by the spinning blades of wind turbines, yet how many are killed by air pollution in areas around coal power plants? Has anyone ever become sick or worried about fallout from a solar power facility? Green power options do have an environmental cost associated with them, but they are still a far better option than non-renewable sources. If properly implemented, they are also more cost effective and can further reduce costs by turning an unwanted effect (heat) into a resource. Overall, no single renewable system can be pointed at and said “There, that is the best solution for everything.” as the sun doesn’t shine all the time, the wind doesn’t blow all the time, and sometimes you have neither. Just like with investing, a diversified portfolio of renewable energy will provide the best security and energy supply. Some wind, some solar, some geothermal, some hydroelectric; all operating together to supply the power we need. Not one big solar facility, not one big wind farm, but thousands of smaller ones each powering a specific area but tied to the national power grid. There would be a smaller environmental impact, it would cost less, and it would be a more secure option than having just a few large stations that could be vulnurable to natural disasters, mechanical failures or even terrorist attacks. In later articles, Iâ€™ll cover the environmental costs associated with other green energy topics including biofuels and hydrogen.